SACHS shock absorbers distinguish themselves through original equipment quality and innovative technology. They provide performance and dynamics, ensuring perfect road grip and cornering behavior, no matter what challenges the road presents. One in seven cars has defective shock absorbers. The problem: Shock absorbers wear down gradually. In most cases, the driver does not notice the increasingly sluggish steering behavior of the vehicle. 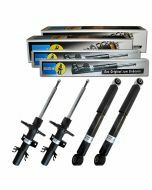 The defective shock absorbers become apparent only in an extreme emergency situation, for example in a sudden evasive maneuver or during emergency braking. Therefore, shock absorbers must be inspected by an expert after every 80 000 km. Numerous well-known automotive manufacturers equip their new vehicles as standard with SACHS shock absorbers. The original equipment know-how is also used for spare parts production. Therefore, SACHS shock absorbers for the aftermarket are always state-of-the-art.